Scott Edelman, a science fiction/fantasy editor and writer that I follow on Twitter, has released an interview that he conducted with Steve Gerber in 1975. 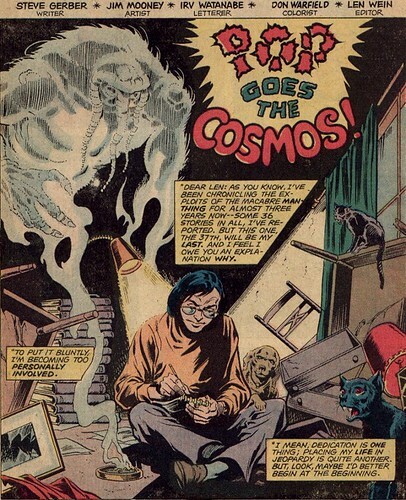 Long time Marvel readers may recall that Edelman edited FOOM and wrote a number of comics, such as Scarecrow, Captain Marvel, and the Defenders. Quite a bit more as well, you can see a list of comics here on his site. Edelman uploaded this 22 minute interview after YouTube lifted the restrictions on video length. There is no real video, just a picture of Gerber. But for fans of Gerber’s 70s work, this is pure gold. Edelman asked the right questions about Man-Thing, Defenders, Crazy magazine, and more. I knew Gerber wasn’t crazy about using Doctor Strange in the Defenders, but it is fascinating to hear him explain why. He had problems with the Hulk, too. Ironic, as I thought Gerber wrote them well and featured them in many comedic moments. Edelman also posted this short audio interview with Archie Goodwin. I do encourage everyone with an interest in SF/Fantasy or Bronze Age comics to follow Scott Edelman on Twitter. He regularly dishes up news, memories of Marvel, but most of all, reveals the dreams he had the night before. Sometimes these dreams even involve Stan Lee or the Marvel Bullpen. Feb. 3rd: I dreamt I was handed a promotional satin jacket for Stark Industries at Walmart by Tony Stark himself. Or Robert Downey, Jr. AS Tony Stark. Feb. 4th: I dreamt that while I was visiting a friend, Randy Newman showed up, remembered me from last time, and handed out Omega the Unknown comics. Feb. 6th: I dreamt that when I went down to the docks at night to pick up my car (which I'd parked there for some reason), I bumped into Don McGregor. Feb. 21st: I dream I sat alone with Stan Lee while he told stories of the old days, including anecdotes about Harry. But he wouldn't say _which_ Harry. Feb. 24th: I dream I was back in my teen Canarsie apartment, but now, and Stan Lee was there for a party. I impressed him with my original MMMS button. I thought I had too much Marvel in my brain! I am impressed that he can recall his dreams so vividly. In addition, Edelman has been scanning a bunch of Marvel memos from the 1970s, such as this one from Bill Mantlo asking if Stan Lee could guest star in Marvel Two-In-One. A treasure trove of Marvel history awaits you on Scott Edelman’s blog. Nuff Said!